was. He'd even written a book on the subject, she'd said, called Faith of our Fathers or something. Once he'd got to know that Bob Paisley was my grandad, she'd warned me, then that would be it. How right she was, too. The thing is, though, you don't always think of these things at the time, do you? When she phoned to say she and her dad would be round to give me a lift into town with Louise and Hannah, our other friends, I'd hardly given it a second thought, despite what Caz had told me. I doubt very much whether Caz had, either. And why should any of us have done? After all, it was our Christmas night out. The only thing on our minds was going out with the rest of the girls and having a good time. Okay, so perhaps it had occurred to me while I was waiting for them to arrive that her dad might ask me a few questions about grandad. So what, though? It would merely be a way of passing the time on the way into town. Answering the odd question or two was not exactly a hardship if it meant us all getting a lift into town. I mean, we all know what it's like trying to get a taxi around that time of year, don't we? I suppose it was after we'd all been been sat outside our house for the best part of twenty minutes that I first began to realise the lift may not have been such a good idea. From the moment I'd opened the car door to get in and he'd turned round to say hello, Caz's dad had literally bombarded me with stuff about grandad. He'd scarcely paused to draw breath. In fact, if I hadn't known different, I'd have said it was almost as if he was terrified to stop talking about him in case we all turned into Evertonians or something. It reminded me of that film Speed where they can't let the bus slow down below fifty miles an hour because it will explode. Well instead of the bus it was Mr. Edge's mouth. And instead of fifty miles an hour it was more like a hundred. As my mother says, he could have talked for England. Scotland, Ireland and Wales couldn't be ruled out either, if you ask me. Nor was it only about grandad. Oh no. It was football full stop. And Liverpool, too. Yeah, especially Liverpool. Anything at all to do with them. Bill Shankly, too. He was really interested in whether I'd ever met Bill Shankly and what he was like and how Mr Shankly and grandad used to get on together and whether they used to visit each other. He even wanted to know whether we all used to go on holidays together. I think he had this rosy image of everyone at Liverpool Football Club being part of one big happy family. You know, as if Anfield was like this fairytale castle where everybody lived happily ever after and everybody went round beaming all the time. That sort of thing. And all the time he'd be laughing and grinning and saying what a great club it was and what great fellows grandad and Mr Shankly were. Almost like brothers he would keep saying. He even seemed to know all about grandad in the years before he came to Liverpool. He mentioned about him playing in the Amateur Cup for some team from the north east called Bishop Auckland or something. I'd never even heard of them before that night. I tell you what, though, I now know the name of all Bishop Auckland's team. In fact, I even know the colour of the socks their reserve team trainer used to wear. Honestly. He just went on and on with stuff like that, hopping from one thing to another. Did I know who was grandad's favourite player? Which had been grandad's favourite team? Was it true he could tell a player's injuries just by the way he ran or walked? At one point he even wanted to know if grandad had spotted any illnesses that I'd had when I was a kid. You know, German measles and stuff like that. He really thought that was funny and kept shaking his head, saying grandad was probably a medical genius. And all the time he was going on, I'd keep looking at Caz and the others and shaking my head and thinking to myself - 'he's bound to drive off any moment now'. But he didn't. He just seemed to get more engrossed in what he was saying. In fact, at one point he even turned the engine off. I thought to myself - 'God, we're gonna be here for the night'. And I must admit at times it seemed as if we were. To be honest, though, I suppose at that stage I was actually finding it all quite amusing, really. Who knows, maybe I was even a bit flattered in front of the others by all the attention and all his compliments about grandad. Not so much what he was saying. I think it was just the idea of a man of his age appearing to get so excited and enthusiastic about my grandad. I mean, I know grandad did all sorts of things in football and wasn't a bad manager and all that. At the end of the day, though, he was only my grandad when all's said and done. It's not as if he was anyone really important or anything. Not like the Duke of Edinburgh or Dustin Hoffman or somebody famous like that. With Caz's dad, though, you'd have thought grandad was every single important person there'd ever been all rolled into one. Some sort of perfect being or something. Of course, with it being my friend's dad I didn't like to be rude. And I certainly didn't want to spoil his illusions about grandad, so I never told him any of the infuriating habits grandad used to have. You know, like complaining to gran all the way through Last of the Summer Wine every Sunday night or dipping his toast in his tea. That sort of thing. Also, I suppose, it did make me feel obliged to answer everything that he asked me. Half the time, though, I never even had to. Caz's dad would get so carried away with the question he was asking he would actually end up answering it himself before I had a chance to open my mouth. Sometimes he would even laugh at his own answer. Now I must admit, since I can't really stand football, and half the time didn't have a clue what he was going on about anyway, I can't say I was altogether unhappy about this. In fact, those times when he did actually need some input from me, I would just say the first thing that came into my head. Anything at all. Yet it didn't seem to matter. Whatever I said, he would just laugh and keep saying over and over what a great man grandad was and how lucky I was to be his granddaughter. It was mad. I mean there we were. All four of us. All dressed up, ready for a night on the town; virtually being held hostage in this car outside our house listening to this strange man I'd never even met before talking about my grandad as if he'd been his best mate. Then it got even madder. After about half an hour, my mother came over to see why we hadn't left. Evidently, she'd been stood on the porch all that time waiting for us to leave. She actually thought we were waiting for another of our friends to show up or something like that. Anyway, I introduced her to Caz's dad and told her we were just having a bit of a chat about grandad. Well, she got the picture right away. She looked at her watch and commented how late it was. Then she coughed, made some lame excuse and quickly made her exit. My mum and me still laugh about it now. Of course, Caz didn't find it funny at all. I'd noticed, as soon as mum had turned up, that she was already beginning to squirm quite a bit with embarrassment. And who could blame her? All of us would have felt the same. In fact, I think she's actually a bit of a hero for being able to put up with it all. I mean, I don't know what I'd do if my own dad was like Mr. Edge. Anyway, as soon as mum had gone back to the house, she really began to go on at him about how late we were. Even then, it didn't seem to register with him. In fact, it wasn't until Caz threatened to tear up his books of Panini football stickers, which were on the back seat next to us, that he seemed to take on at all. It was only then that we finally set off for town. Pity we hadn't thought of it a bit earlier. Even then, though, on the way into town, he continued talking and asking questions. He just didn't seem to grasp that by then we'd all had enough. And by this time, I must admit even my own patience was being stretched a bit thin by some of the things he was saying. Don't misunderstand me. It's not that he was being deliberately rude or anything. It's just that some of the things he was coming out with were a bit...well, put it this way - why is it that older people always have to try and spot whether you've got a resemblance to someone? I mean, I know grandad was lovely and cuddly and all that but I don't actually look anything like him. And I certainly don't want to be told I do when I'm on my way to a bar in town. I mean, there's no way anybody would ask me to dance if I did look like grandad, is there? Mind you, I suppose if the blokes were anything like Caz's dad, I'd probably have to fight them all off. There'd be a queue stretching as far as the Pier Head. The worst bit was when we arrived outside the bar in town. It became quite obvious he was talking even faster. Asking about half a dozen questions at once, as if he was desperate for us not to go in. I must admit I did feel a bit sorry for him because he did seem all lonely and that with us all going off and leaving him. He kept saying I'd have to come over one night and see some of the football stuff he had back home and that he had this photograph from 1969 of himself and some Liverpool player called Bobby Graham which he'd really like me to see. I suppose it was all a bit sad, really. By this time, though, Caz and the others were outside the car shouting at me to come out. In the end I just said goodnight to Mr Edge and went with them, thinking that was that. Anyway the next thing we knew he was there outside the entrance to the bar. Right next to us. He was saying he might as well come in with us. That we'd barely skimmed the surface of grandad's career at Bishop Auckland. Well, honestly, I could have died. God knows how Caz must have felt. Your own dad trying to get into a trendy bar with you. She just went white and walked off the other way. Anyway, thank God, it was then that the bouncers stepped in and told him they couldn't let him in wearing carpet slippers. Well the relief we all felt. I mean I'm not ungrateful for the lift or anything but there is a limit. Next time Caz and I have decided we'll get a taxi. In fact, maybe we'll even walk. 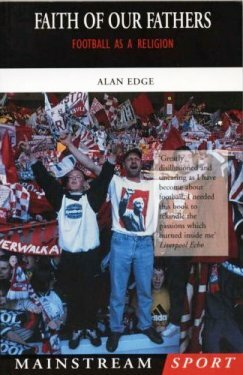 LFChistory.net recommends reading this excellent book by Alan Edge. Truly inspired!